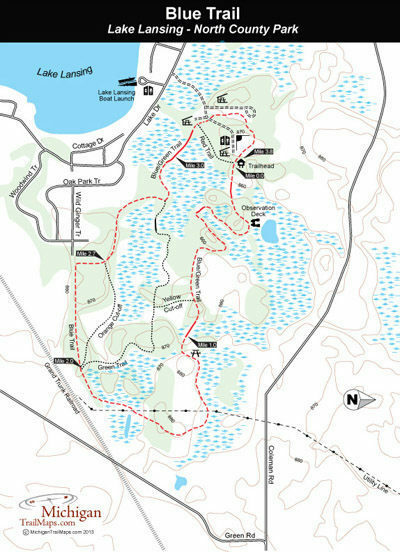 The Blue Trail is the longest loop in Lake Lansing – North County Park at 3.8 miles and also the newest. It was completed in the early 1990s after a development company granted the Ingham County Parks Department permission to construct part of the loop across private property. Though shorter, I find the Green Trail to be a more interesting hike as it includes more segments along and even across the wetlands that make Lake Lansing – North such an usual county park. You can also shorten the Blue Trail to 3.2 miles by following the Orange Cut-off. 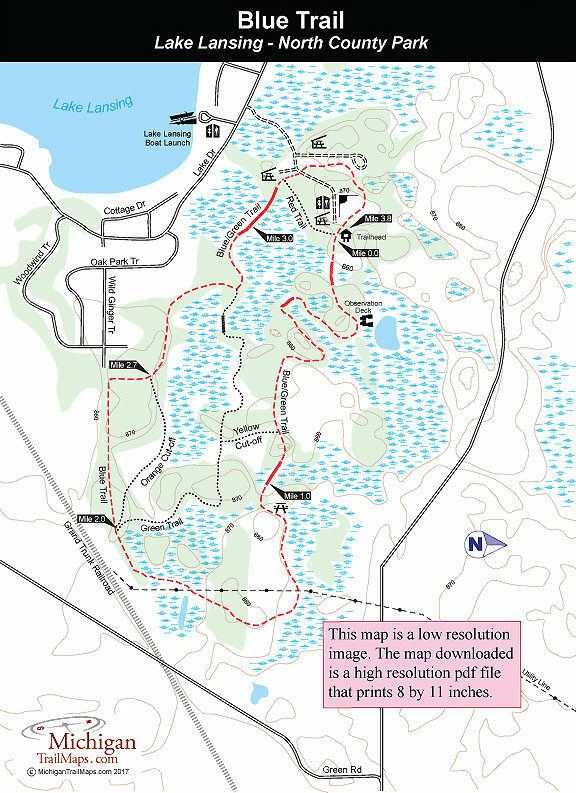 The Blue Trail is the longest loop in Lake Lansing – North County Park at 3.8 miles and also the newest. It was completed in the early 1990s after a development company granted the Ingham County Parks Department permission to construct part of the loop across private property. Though shorter, I find the Green Trail to be a more interesting hike as it includes more segments along and even across the wetlands that make Lake Lansing – North such an usual county park. You can also shorten the Blue Trail to 3.2 miles by following the Orange Cut-off. The Blue Trail and Green Trail begin at the main trailhead and are the same path for the first 2 miles. The so-called Blue/Green Trail leaves the park at Mile 1.8 and then the two trails split just before the Mile 2 marker. 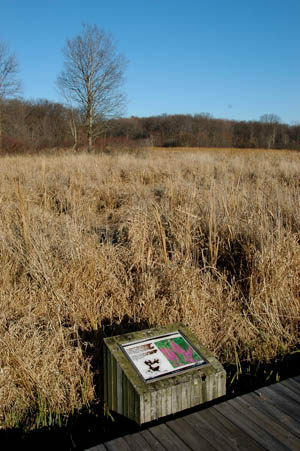 The Blue Trail continues west in the woods but provides more views of a wetland to the south. At Mile 2.4 the trail arrives at a neighborhood trailhead and access point and here you can see the homes lining Wild Ginger Trail while still standing on the path. At this point the Blue Trail swings sharply north. More homes are spotted through the trees briefly before the trail re-enters the park and at a well-posted junction at Mile 2.75 merges with the Green Trail again. Shortly after that the trails cross the park’s longest and most impressive boardwalk and arrive at the Oak Knoll Shelter and picnic area. Lake Lansing – North offers picnic areas with three shelters and restrooms along with a softball field, horseshoe pits, a sand volleyball court, a basketball court and two playgrounds. Lake Lansing – North opens a half hour before sunrise for pedestrian access and 8 a.m. for vehicle access. The park closes a half hour after sunset. At several of the Ingham County parks there are vehicle entry fees but not at Lake Lansing North. From I-96, depart at exit 110 and head north into Okemos. Turn east on Grand River Avenue and then turn north at the first light onto Marsh Road. Follow Marsh Road through Haslett and then turn east on North Lake Drive where the park is posted in 1.5 miles. Call the Ingham County Parks Department (517-676-2233) or check its web site (www.ingham.org/PK/Home.htm).